You all have seen my first chair makeover project (if not you can see it here) and I loved that redo so much that I decided to do another one. I posted about the before HERE, and then forgot to post the after pics, oops. The Hot House pillows I won from Kristine at Living with Style awhile ago and never posted the pictures of them in my apartment or said a proper thank you to her. So thank you Kristine, the pillows are more than perfect!! Its like they were made just for me- I love them! Wow, your chair re-do looks amazing! I would love to redo my dinning chairs but I am very intimidated by it! You did an completely outstanding job! 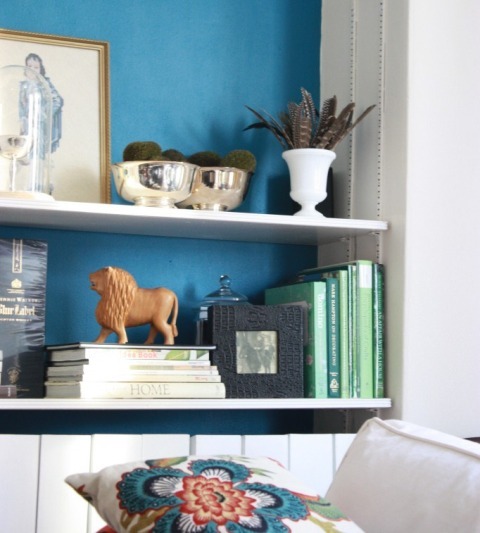 It is so chic, and love how the blue in the pillow relates to the paint color you used on the back of your built-ins! ENJOY!! Love it!!! The chair looks fabulous, and the way you styled it, even better! I am still going to redo my ottoman using your suggestions--so far, I have gotten the upholstery nails, redone the legs, and now I just have to find the fabric (which is proving to be the major challenge!). But now I am inspired again (yay!). Looks great! Have a great holiday! Oh dear, now THAT is lovely!!! It's gorgeous! I'm wishing we had a good upholsterer here! Love the white on white. Fabulous job! You are so good at working those chairs!! Hope you have a great thanksgiving! I LOVE IT! It turned out beautifully!!! And the pillow looks fab with your bookshelf color. Love it! You did such an amazing job!! Well done! day and night! love the new, clean white look with an colorful pillow. fantastic. Looks even more beautiful in person! Love it! So perfect with that pillow! What an exciting change! Great job love the nail heads. Happy Thanksgiving. The chair looks great! 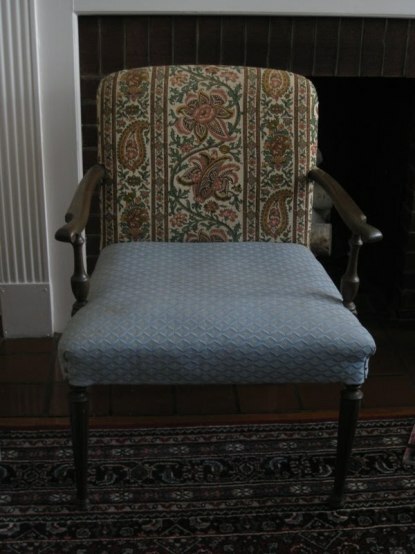 I live in NYC and just picked up 2 dining chairs off the street - great condition but BAD fabric. Your chair is inspiring... I think I'll go for nailheads! 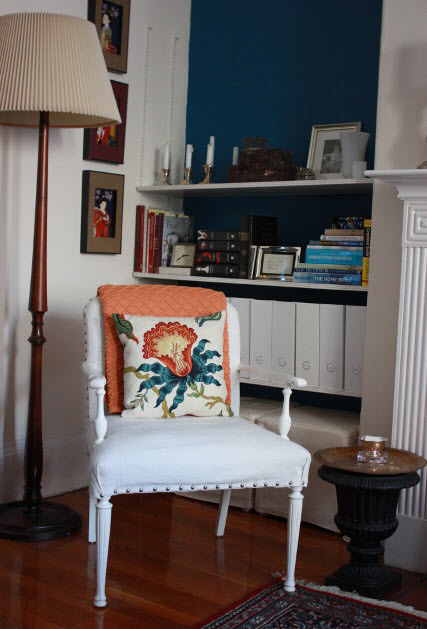 It is so chic, and love how the blue in the pillow relates to the paint color you used on the back of your built-ins! it looks so nice and fresh! great redo! amazing!! 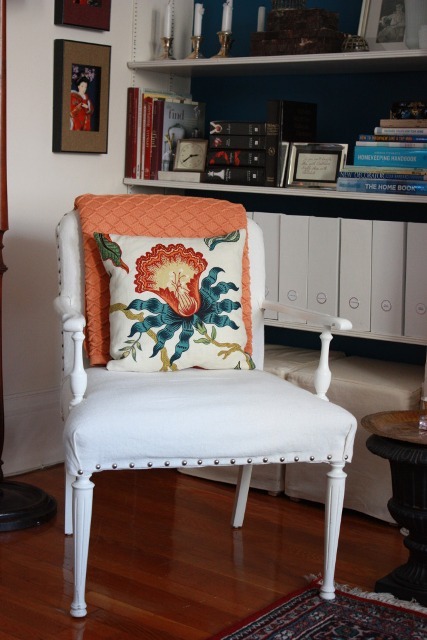 love the chair, love your blog, too! Wow!! You've got mad skillz. The chair looks great! I love what you've done! You wouldn't want to do any pro bono work for a girl with a very confused living room, would you?! Great work! This chair makeover would fit in perfectly on my blog raenovate. Happy Holiday's! Looks great. And I'm always a fan of your bookshelves! Great job on the chair! and that pillow is PERFECT for the room! I've been hearting that fabric since the first time I saw it on Kelly's blog (high street market). Thanks for taking the time to check out my blog. I've been a silent follower of yours for a while! I guess I need to come out of hiding more!! !